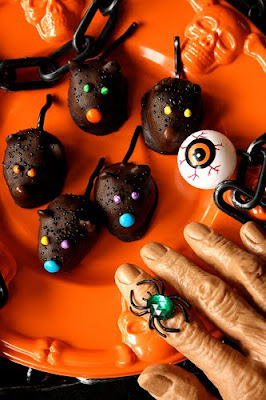 Amanda's Parties To Go: Halloween Goodies! I don't know about you, but this time of year just makes me crave SUGAR! Maybe it's all the great photos I'm seeing of Halloween goodies circulating around the blogosphere. My what a wonderful world of creativity there is out there! I could spend the entire month just going to the grocery store and coming home to make treats.... yup, and eating them, too! 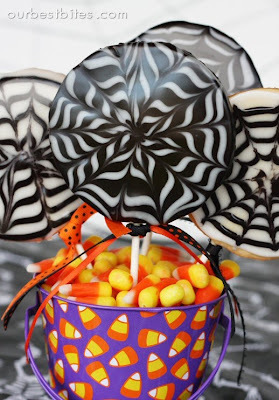 Look at these amazing spider web cookies from Our Best Bites. And with her step-by-step tutorial, I think we could do it, too! I can't even imagine how excited my kids would be if THIS were their afternoon snack! And wouldn't these be fun to make WITH the kids? Well, maybe not fun for you, but the kids sure would like to get their hands in some colored frosting and marshmallows! What a great memory to make. You can see more photos and even a tutorial at Amanda's Cookin. And look at these little mice..... CA-UTE! 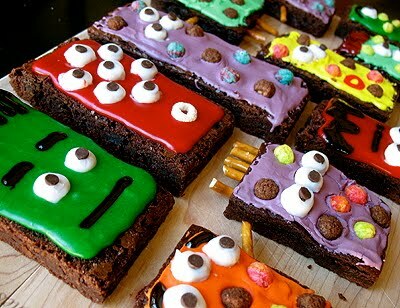 Or maybe so ugly they're cute, but hey, they're chocolate -- I'll eat just about anything covered in chocolate! Find the recipe and how-to at Suzie the Foodie. It was a great weekend around here for Shindig and I'd like to give a few shout outs. A BIG thank you goes out to Catch My Party for featuring Shindig's Fairy Party Dessert table and Printables Collection as their Party of the Day over the weekend. Jillian does an amazing job bringing party inspiration to the masses! And I'd also like to thank And Everything Sweet for featuring our pudding parfaits from Shindig's Valentines Soiree post. What a yummy site she has! And last but not least, Edible Crafts did a feature on Shindig's Halloween Dessert table and Printables -- Thank you! Thank you! Thank you! You have all made my weekend!